The Maori were the Polynesian people who first settled New Zealand (‘Aotearoa’). They are believed to have occupied the islands since around 1100AD. 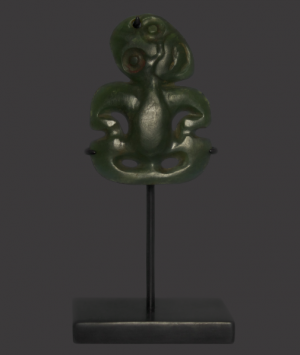 Personal ornaments such as this were known to them as ‘hei tiki’. ‘Hei’, refers to something suspended from the neck and ‘tiki’, is the name ascribed to all carved human figures. 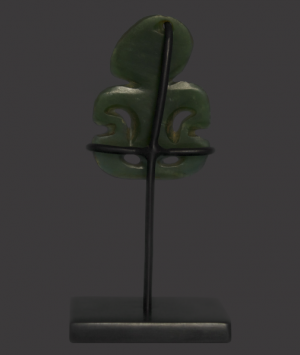 Laboriously fashioned from an indigenous form of jade found on New Zealand’s South Island known as nephrite, or ‘pounamu’ to the Maori, ‘hei tiki’, were traditionally worn suspended from the neck by a finely woven fibre cord and fastened with a bone toggle, the surface appearance of these works of art gradually improving with age as a result of protracted human contact. 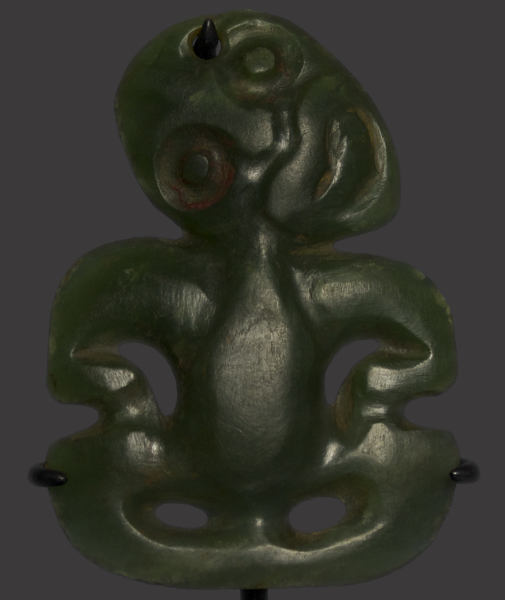 Regarded by the Maori as hugely important possessions, treasure (‘taonga’), they were handed down from generation to generation, the pendants inheriting their magic and power or, ‘mana’, from the successive ancestors who wore them. An undoubtedly ancient form, ‘hei tiki’, were certainly encountered by the first European visitors and the sacred and personal nature of them was observed and understood, further intensifying the desirability of acquisition in trade. The practice of re-cycling nephrite, (‘pounamu’), adze blades during the 19th century derived principally from two key motivating factors, these prestigious Maori tools becoming somewhat obsolete after the introduction of metal counterparts by the European visitors and to sate demand for the pendants from both the Europeans and the Maori themselves whose desire to wear them as ornaments in this century had increased, possibly influenced in part by the European interest in them. 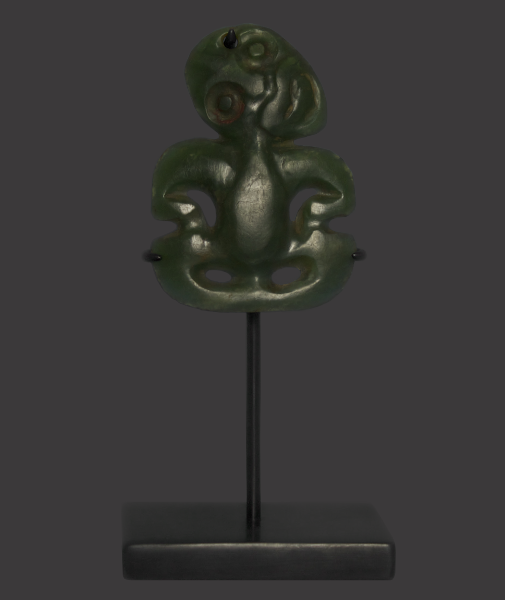 The precious stone was still of course highly valued and the popularity of ‘hei tiki’, as a trade item had obviously existed and remained undiminished since the point of first contact, instantly recognised, a unique and iconic object synonymous with the Maori people, they were highly prized by the Europeans, eager to collect curiosities to return home with. 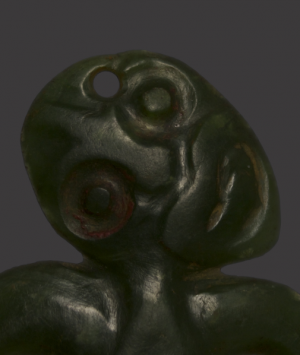 The true symbolic meaning of the ‘hei tiki’, remains obscure and has been the subject of much debate, however with the various and often conflicting interpretations remaining purely speculative, its historical origins appear to have been lost in antiquity. This stylised human figure is carved in low relief with typical features. The eyes retain traces of red sealing wax, a common post European contact characteristic, the head is inclined towards the right shoulder, the arms represented by symmetrical downward projections with the hands positioned resting on flexed out thighs, it was probably converted from a redundant rectangular adze blade (‘toki’), during the 19th century.